The departure of a generation of young men to fight in the Great War was felt keenly by families world – wide and poignantly expressed in the form of mass-produced cards known as Great War Silks. These cards were originally hand-embroidered by women in France and Belgium, but as demand increased, production moved to textile factories in Paris. Soldiers at the front bought them for a few francs and posted them to family members. Many cards have messages addressed ‘To my dear Mother’, ‘To my dear Sister’, ‘To my sweetheart’. Many had patriotic symbols, flowers or regimental crests. At a conservative estimate, some ten million cards were produced and are now in museum and library collections throughout the world. 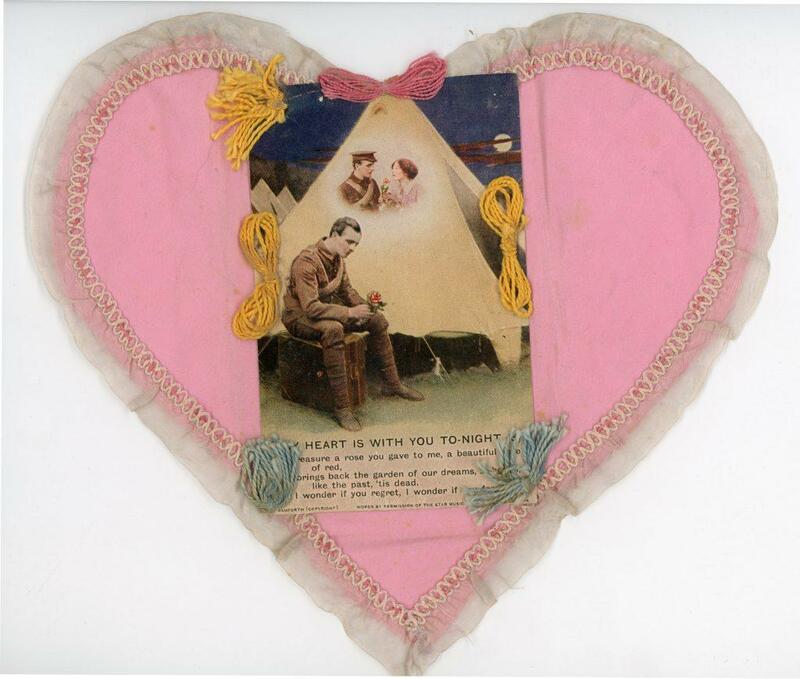 This Valentine card in the Stirling Smith collections is not a traditional Great War silk, but a card which has been sewn and glued to a hand – finished pink silk heart, and treasured by the recipient of a hundred years ago. As Valentine’s day comes around, it is worth remembering the pain of separation caused by conscription, injury and death for the young people of 1914 – 1919.